Thought Experiment: Could I get to the point where 100% of the food I eat for myself is made from local ingredients? “Local” means within 100 miles. This doesn’t count social meals; going out with co-workers for drinks or taking friends or family out to a restaurant. I wouldn’t force this on my hosts if a guest at someone eles’s house, nor would I force it on my own guests. First question: How about local restaurants? I can’t be sure that their ingredients are local. So that’s out. So. Let’s stroll through my fridge, freezer, and cabinets, and see how big of a challenge thus would be. Dairy — I already get my dairy from a local farm. 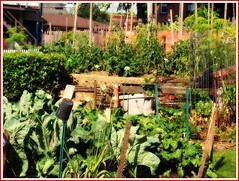 Vegetables — I could freeze and can vegetables in the growing season. Condiments — Well, Heinz didn’t invent ketchup. I could always make my own; that’s how housewives did it 100 years ago. Flour and cornmeal — There are actually local mills that mill flour, though I’d have to get a lot at once (2 to 5 pounds). That’s not unreasonable. Sugar — Fortunately, sugar can be substituted with honey in most recipes. Beans — Grow my own, or buy local varieties. Fortunately, I don’t eat a lot of beans, so this wouldn’t be a huge burden. Nuts — I do know of several local nut farms. Rice — Okay, this just can’t be done. So, I suppose, I just wouldn’t eat rice at home. Salt, pepper, and other spices — Also impossible. What about other ingredients that simply can’t be grown locally, like coconut and pineapple? For the purposes of this experiment, and for now, they’re banned from consumption. How do I eat in the winter, when no food is grown? Same as my ancestors: can food during the growing season, or use easily-preserved foods like dried beans. Plus, thanks to my local dairy, I can have meat and dairy in any season. I could actually get pretty close to my 100% goal, if I wanted to. I don’t, yet. But now that I’ve worked the numbers, a part of my brain is pointing out how healthy this would be. I suppose the real question is, why do you want to eat 100% locally? Is it to eat healthier? Support local produce? A challenge for yourself? What do you hope to gain by it? The answer to these questions will determine how beneficial this is and how long you will do it for. I certainly agree that eating locally grown produce is good, tastes better, and might be healthier. (Also, that processed food should be moderated in use.) On the other hand, one of the great things about human society is the ability the trade for goods that we ourselves cannot make or grow. Items like tea, rice, chocolate, cinnamon & other spices, oranges, coffee, pineapple, corn, potatoes, etc. which were all once confined to certain areas, are now staples the world over. I suppose what I'm trying to get at is, why would you want to restrict yourself to a dietary lifestyle that emulates pre-trade antiquity? With all the problems reliance on a limited diet brings, both in terms of yearly supply and health? Humanity is stronger, taller, and healthier now with international trade than it has ever been. Why would you want to deny those advances, and the wonderful new foods that come with it, to revert back to what we were before – dependent on a local agricultural economy? I don't mean to sound accusing, or to put you off doing this if you really want to. Certainly it would be an interesting experiment. But for myself, I enjoy my imported “staples” too much to give them up. My food tastes better with them, I have greater variety, and I firmly believe that I am happier and healthier as a result.